Americans are now officially doomed, because I am sure that President Obama will sign the Food Safety Modernization Act into law. Your government has taken away YOUR right to grow YOUR own food on YOUR own land, to save YOUR own seeds and to exchange YOUR produce with YOUR friends and neighbors! Soon you will be treated like marijuana growers, if you grow tomatoes or salad on your own land. 2. … and practice civil disobedience the way Gandhi did. 3. If the government raids your property, then you should be prepared for that by forming groups, that will sue the government for violating your constitutional rights. 4. If all legal options fail, then we need to remind the US government of the second amendment. 5. If the US government will refuse to give us our constitutional rights back, turning itself into a fascist dictatorship, then we the people have the right to shoot the bastards. When witnessing such a moment in history when the federal government greatly expands its power over an entire industry, it’s important to understand the Law of Unintended Consequences. Virtually everything bad that happens after a bill gets passed is due to this Law of Unintended Consequences. On the surface, the intention behind the food safety bill seems innocent enough: Let’s all protect the food supply and prevent people from getting sick due to e.coli and salmonella exposure. But the reality of the result that emerges from the law is quite different. Because the S.510 / HR 2751 food safety bill places an enormous new burden on U.S. farmers — yes, even small farms that are supposedly “exempt” — it’s going to drive many farmers out of business. • A reduction in the available SUPPLY of fresh local produce. • A loss of local farming know-how and food sustainability. • The financial failure of CSAs, food co-ops and small local markets. • The loss of countless jobs that were related to local food production. 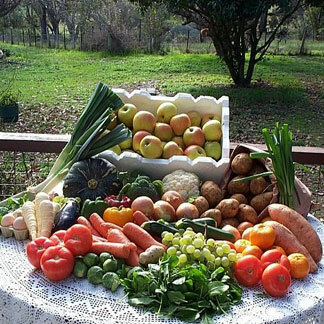 • An INCREASE in the price of local food, especially organic food. At the same time these huge regulatory burdens are thrust upon U.S. farmers, there are no new regulations required for food grown outside the United States. This means that food coming into the USA from Mexico, Chile, Peru or anywhere else does not have to meet S.510 food safety regulations at all. The FDA, after all, doesn’t inspect greenhouses in Mexico or grape farms in Chile which export their products to the United States. Furthermore, many dangerous chemical pesticides that have been banned in the USA are legal to use elsewhere, and foods treated with those pesticides are perfectly legal to import into the United States. So instead of buying food grown in the United States on small, organic farms, more U.S. consumers are going to be buying food grown elsewhere that’s treated with extremely toxic pesticides. • An INCREASE in the importation of fresh produce from other countries. • A worsening of the agricultural trade imbalance between the U.S. and other nations. • An INCREASE in the pesticide contamination of fresh produce sold at U.S. grocery stores. • An INCREASE in agriculture jobs in Mexico, Chile, Peru and elsewhere, even while agriculture jobs are lost in the USA. • A DECREASE in the overall safety of the food supply because now the proportion of foods imported from foreign countries with little or no regulatory oversight will greatly expand compared to U.S. grown foods. In effect, then, what Congress has done is impaired the competitiveness of U.S. farms, shifted farming jobs out of the country, increased the pesticide residues in fresh produce sold in U.S. grocery stores and harmed local food security and sustainability by driving small, local farmers out of business. Such is the nature of the Law of Unintended Consequences. And such is the nature of just about everything that Big Government tries to do when it threatens to “solve problems” by expanding its regulatory control over almost any industry. What Congress fails to understand is that we need food security far more than we need more FDA regulations. The knowledge base of local farmers who know how to grow, harvest and distribute food is far more valuable to the security of our nation than preventing a relatively small number of people from getting sick from e.coli each year (even if such a trade-off were a simplistic equation, which it isn’t). Because if we lose food security, then we become slaves to the big corporate food producers who are attempting to centralize food production and place food, seeds and crops under their absolute control. A cynic might even suggest that was the whole purpose of the food safety bill in the first place: To destroy small farmers and centralize food production power in the hands of a few wealthy corporations. Whether that was the intent or not, it is certainly going to be the effect. What Congress has done with this food safety bill, in effect, is to cripple America’s food production know-how and poison the population with far more dangerous pesticide-ridden produce that will now be imported from other countries instead. This bill should have been called the “Mexico Farming Jobs Act” because it’s going to shift countless jobs south of the border as farms in the USA realize they simply can’t operate under the immense burden of FDA regulatory tyranny. It all makes you wonder what the members of Congress are really thinking. Don’t they ever step back and attempt to consider the real-world ramifications of their actions? Time and time again, the U.S. government seems to do the opposite of what would reasonably be required to solve problems. Think about it: When the U.S. government wanted to stop Wall Street bankers and investment firms from wasting money, it simply handed them a few trillion dollars in new money so they could waste more. When the government wanted to end debt spending, it spent more debt money out of the foolish belief that you can somehow end your debt by going deeper into it. When the government claimed it would reduce your health care costs and cover everyone with health insurance, it passed a sick-care law that has only seen health care costs spiraling out of control while insurers cancel policies and end coverage for many children. And now, the government claims to be making your food safer even though the real impact of the new law will be to make your food far more dangerous while destroying U.S. farming jobs. This is why those who really know government also know that they who govern best govern the least. Instead of trying to “fix” all the nation’s problems by meddling with the actions of hard-working people trying to make a living (such as organic farmers), the government needs to simply get out of the way and let farmers produce their food without the heavy regulatory burden of the FDA — an agency that we know is frequently engaged in actions that can only be called criminal in nature (http://www.naturalnews.com/030461_S…). With the passage of this food safety bill, I am now publicly predicting skyrocketing food prices over the next two years. We will see fresh, local produce become increasingly more expensive and more difficult to acquire. Many local farmers will shutter their businesses, and farming know-how will be lost for perhaps a generation. The damage that will be done to America’s food security and agricultural base is incalculable. Such is the price we shall all pay for allowing our representatives in Washington to once again violate our Natural Right to grow food and exchange it for goods or cash with our neighbors. The reason this Natural Right was never even mentioned in the US Constitution, by the way, is because the right to grow your own food without government interference is such an obvious “Natural Right” (a God-given right, or a right that is self-evident) that our forefathers never imagined such a right would be infringed by the federal government. Or if a right were ever infringed by the federal government, our forefathers were certain that the citizens of the United States of America would exercise their other Constitutional rights to nullify the attempted overreaching authority of the federal government and thereby restore their freedoms. Sadly, such a solution does not work when the majority of the population is lulled into a false sense of freedom by a government that deliberately lies to them on a daily basis. Freedom does not exist with the vast majority of the population has no interest in defending it. Better buy yourself some heirloom seeds while you have the chance. Plant your stealth garden and cover it with camouflage so the government can’t see it and order you to destroy it. Soon, backyard vegetable gardeners will need to operate like marijuana growers and start hiding their food from government’s prying eyes. No doubt the U.S. federal government will start using spy satellites to identify “unregistered gardens” that will be targeted for termination. Soon, small farmers may even be raided by armed FDA agents who terrorize their operations and seize cabbages. Seriously. It sounds crazy today, I know. But a decade ago, no one thought the government would ever outlaw raw cow’s milk and arrest ranchers for selling milk to their neighbors, and that’s now happening on a regular basis. In five years, FDA farm raids may be routine. That is, if there’s anything left of the federal government (as we know it) in five years. (Actually the only good news is that the US will collapse as planned by the elite before those traitors can take away your own food. – Infinite) I’m not sure how long they can keep up the financial house of cards, frankly. Always remember this enlightening fact: The entire federal government is just one paycheck away from collapse. I wonder how long FDA inspectors will keep harassing farmers if their paychecks stop? Remember, FDA employees have no loyalty to anything other than their paychecks. Once the money from Washington stops, the army of FDA mercenaries collapses virtually overnight. And the resilient farmers of America will win in the end, I have no doubt. If I had to choose to live on a deserted island with either ten North Carolina farmers or ten FDA bureaucrats, the choice would be a no-brainer. Farmers can keep you alive. FDA bureaucrats will only stab you in the back, steal your coconuts, and refuse to do any actual work on their own. They are, after all, parasites who feed on taxpayer dollars and lend nothing of value to society. If the FDA actually did anything useful at all, it would have banned mercury fillings to protect the public from mercury toxicity (http://www.naturalnews.com/030741_m…).